HOUSTON, Texas (KTRK) -- Monday was a typical work night for Claudia at High Rollers smoke shop on Monday. That was until three masked, armed men rushed inside. The frightening scene was captured in surveillance video. "I thought I was going to die," she recalled. The men pressed a gun to her head and shouted commands at her and the sole customer inside, roughing them up and forcing them to the back room. In the video, you can see the customer crawling on the floor to get away. Out of frame, a bandit keeps a gun fixed on the woman's face. The men demanded that she open the safe. "Please! I can't! I don't know it! I don't know it!" Claudia is heard telling the assailants, unable to give the code to the safe. "I told them to take it. 'There's three of you. Take the safe.'" As they threatened her life and demanded cash, she feared the worst. "I thought they were going to take me. I thought they were going to hurt me. The worst things were going through my mind." The group gave up on the safe, took a few hundred bucks from the register, but they weren't done. "What kind of car you drive?" one of the suspects asks on video. "A Honda. What do you want?" she replies. The group took her phone and car keys, but amazingly, didn't steal her car. "They said, 'Get on the ground, count to 40. Don't come out until you're done counting,'" she recalled. A couple of days after the three men stormed the smoke shop, she is still processing what happened. She said watching the surveillance video footage is "heartbreaking honestly." "It's like it's not even me," she expressed. "I just want people to know they can't do this and get away with it." 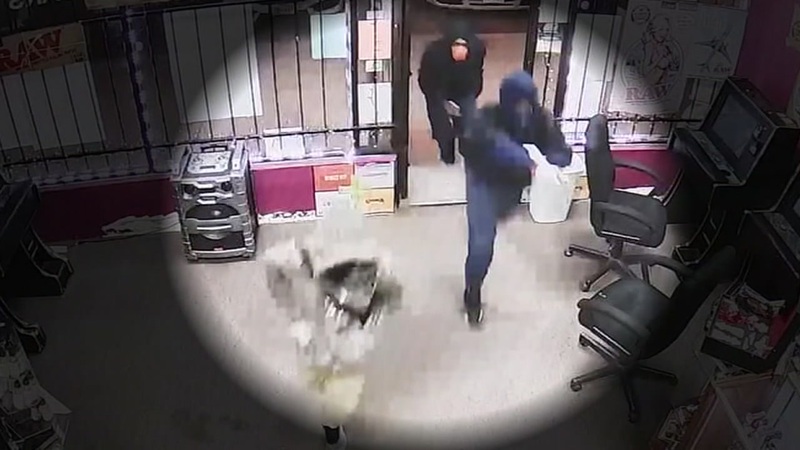 Since the robbery, the business added security measures, and they're offering a $1,000 reward for information that leads to an arrest.